I remember, as a teen, working at a summer camp on a brackish river near the Chesapeake Bay. One night a bunch of us were sitting on the dock and I noticed small flashing blueish white lights in the water. At first I thought they were tricks of light, but on close inspection (fishing one out with someone’s hat) we found they were small jellyfish, tiny enough to fit in a tablespoon. I don’t know what kind they were, but floating along in the dark water, they seemed of another world. That was my first exposure to bioluminescence (the emission of light from living things), beyond fireflies. But the world of bioluminescence is much broader than that. So today I am going to give you some sciency info about bioluminescence. Maybe these will give you some ideas on how to add a creepy glow to an otherwise pitch black forest or give a spark of brightness and magic to a character. Bioluminescence is the reverse of photosynthesis. In photosynthesis, a living organism captures light and carbon-dioxide (CO2) to make organic materials. The byproduct is oxygen. In bioluminescence, oxygen is used to break apart organic material. The byproducts are CO2 and light. A few animals (the angler fish for one) use bioluminescent bacteria to emit light for them. But most producers of bioluminescence create their own light. These produce two chemicals: luciferin (a pigment) and luciferase (an enzyme). The luciferin reacts with oxygen to create light. The luciferase acts as a catalyst to speed up the reaction. The reasons for bioluminescence are as varied as the number of organisms that exhibit it. Adult male fireflies use it to attract mates. Firefly larvae may use it to warn off predators. Anglerfish use it to attract prey. Other creatures use it as camouflage, to ward of predators, as communication, or even as a sort of a flashlight, to help the animal see. Bioluminescence is rare on land, but in the sea it is the rule, rather than the exception. Edith Widder, an expert on the topic, says that 80-90% of the creatures she brings up from the deep ocean exhibit bioluminescence. 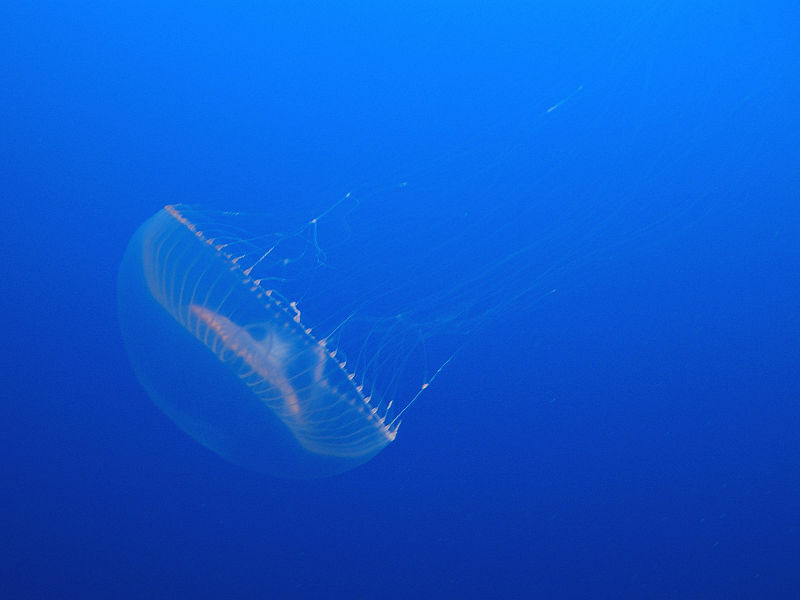 In the dark depth of the ocean, it is the only light that marine creatures ever see. Luminescent displays by sea life include individual flashes of light, repeated flashes of light, and animals squirting luminescence into the water. In some deep ocean areas, scientist have observed glowing orbs of liquid light the size of footballs made by hundreds of tiny animals squiring luminescence into the water. Many of the organisms that exhibit bioluminescence are very small but occur in large numbers so their light affects huge swaths of the sea. As a rule, they glow only upon disruption – when waves crash, ships churn the water, or when fast-moving fish or sea mammals swim through them. The well-known Red Tide in California is caused by tiny dinoflagellates that light up in response to the waves crashing on the shore. Bioluminescent bacteria occur in almost all oceans. 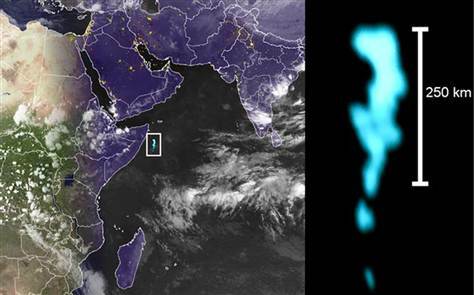 In the Indian Ocean, they cause the spectacular “milky sea” phenomenon where sailors report sailing through sea that glows from horizon to horizon with a soft milky white light. Some fungus, such as Panellus stipticus, bears mushrooms that glow green. 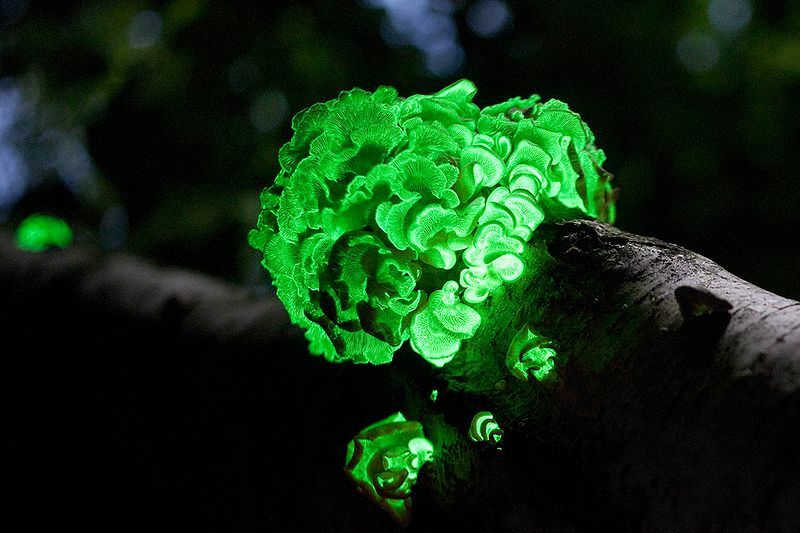 These bioluminescent fungi (along with dozens of other species) are also known as Foxfire, “Fairy Fire,” or “glow wood”. Foxfire has made an appearance in writings from Aristotle to Mark Twain and has even been referenced on the TV show Lassie. Yes, you already know about fireflies. But here’s a thing that’s really interesting that a lot of people don’t know – in some species, all the fireflies in a single population synchronize their blinking. In fact, the synchronized fireflies of Elkmont Nature Reserve in Tennessee put on such a light show that thousands of visitors flock there every June to witness the display firsthand. TED TALK: Glowing Life in an Underwater World, in which Edith Widder explains (among other things) how there is so much bioluminescence in the ocean, that the seawater in toilets on her ship glows in the dark. Super cool. Thanks Kim. I can’t wait to watch the Ted talk when I have a bit more time. Thanks Jocelyne. Glad you enjoyed it!